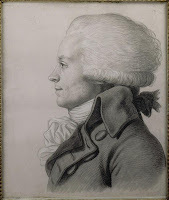 Rodama: a blog of 18th century & Revolutionary French trivia: Robespierre's manuscripts "saved for the Nation"
The hitherto unknown manuscripts had been preserved intact by the descendants of Philippe Le Bas. 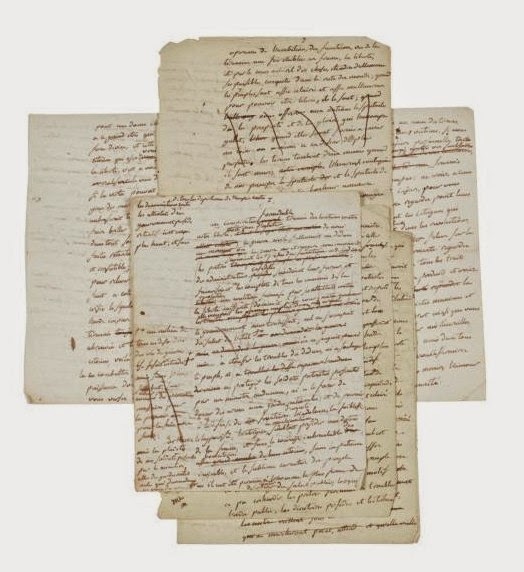 The sale, which was held at Sothebys in Paris on 18th May 2011, comprised two lots: Lot 31 (Fonds Le Bas) contained letters of Augustin Robespierre and Le Bas and Lot 32, the papers of Robespierre himself. The latter comprised 116 densely written and heavily corrected pages containing drafts or notes for some of Robespierre's central speeches including the "Discours sur la guerre" delivered at the Jacobin Club on 25th January 1792 and his final speech to the Convention on 8th Thermidor. In one paper he outlines the case for the execution of Louis XVI and notes the division of the Convention into "Left" and "Right". A single letter, to an unknown correspondent, discusses the relationship between Happiness and Liberty. Both lots made well over their estimates. According to the rules of preemption, the state was obliged to match the winning bids,totalling 979,400 Euros in all. The representatives of the Archives Nationales literally stepped up at the last minute, to the general applause of the crowd in the auction house. These documents, kept in the family of Le Bas and Élisabeth Duplay, are particularly valuable as, although there are sizeable holdings of manuscript material in various public archives, the originals for much of Robespierre's vast Oeuvre have long been presumed lost. After Thermidor a Committee of Twelve headed by E.B. Courtois was appointed to examine Robespierre's papers. Many were seized at this time and thought to have been subsequently destroyed by his former associate Armand Guffroy. It was believed that others in the house were successfully hidden by Éléonore Duplay only to be destroyed - along with the Gérard portrait - by Simon Duplay in 1815. Just three copies of speeches, along with a few letters, escaped. That of 8 Thermidor, Robespierre's last, was the only one to survive in his own hand. Where there are no published versions, Robespierre's modern editors have had to rely on reports and transcripts made when the speeches were delivered, many of which contain considerable textual variations. Inevitably, there will now be a long pause whilst the new manuscripts are subject to scholarly appraisal. A preliminary assessment was published in a special Robespierre edition of the Annales historiques de la Révolution française in January 2013 by Annie Geffroy, who is working on a digital copy of the manuscripts on behalf of the Société des études robespierristes. The final tally of the Archive Nationale's new Robespierre collection 683 AP/1 is 126 pages, since it includes a report "on finances" dating from the last days of the Constituent Assembly which was acquired at a separate auction on 12th May. The papers, mostly single sheets, have been arranged into 12 files. File 6: Speech of 7 May 1794/ 18 Floreal Year 2 on the cult of the Supreme Being. Most of the material has already been published in Robespierre's Oeuvres, but with some inaccuracies and no clear idea of authorial process. According to Annie Geoffrey, the pages recently purchased by the National Archives must now be added to the already large number (several hundred sheets) in the public archives (AN F7 and F17, BNF Manuscripts, AD Pas de Calais), or sold since 1800. She suggests initial cataloguing on the French database MUSE ["Manuscrits, Usages des Supports et de l'Ecriture"] which has suitable provision for detailed physical description. Even at a glance, however, the manuscripts are eloquent testimony to Robespierre's attention to detail, the thoroughness of his preparation, and the laborious reworking which went into his articles and speeches.